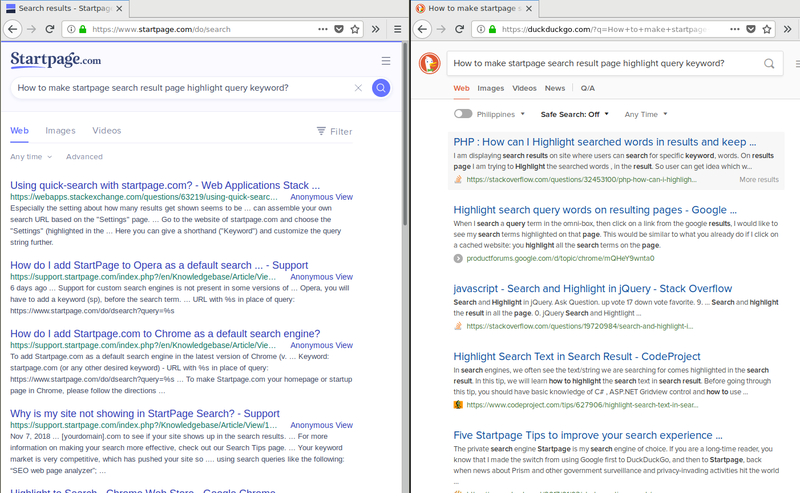 How can I make Startpage's search results page automatically highlight query keywords used in the search without changing the browser's search tools? For example, DuckDuckGo automatically highlight almost all query keywords in the search results. Just because the browser can do it, doesn't make it convenient to do it as an additional, separate step, so maybe not a great decision on their part. But there it is. // @description    This greasemonkey UserScript helps the user to focus on the revelant information in the result page. It basically put the search terms in bold. Not the answer you're looking for? Browse other questions tagged search-engine startpage or ask your own question. How to search for website contains some keywords in its main domain? Where to find a list of Google search operators? How to manually specify the search language in Startpage.com?